The Halloween wreath spot was filled by a cute paper wreath that my daughter made at preschool. And a ghost she made. And a paper plate jack-o-lantern. Oh, and a bat. Our door is quite the collage of preschool art projects, but I couldn't love it more. 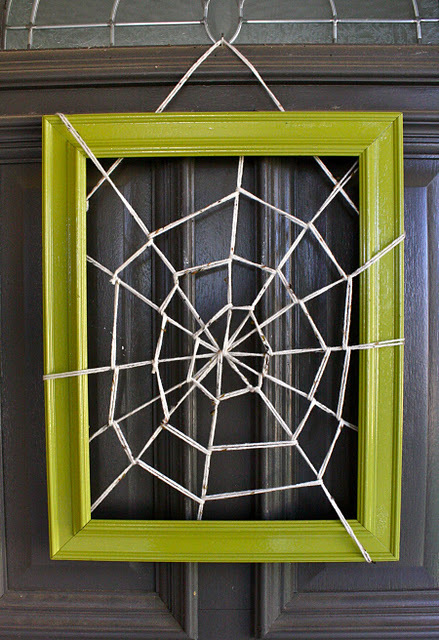 But if you don't have a homemade preschool Halloween wreath for your door, you might want to consider a framed spider web wreath for the spot. It was inspired by one of my favorite wreaths from last year, the framed spooky tree Halloween wreath from Delia Creates. 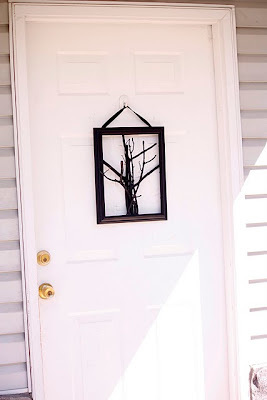 I am in love with all frame wreath ideas, and this one is right up there at the top. You can check out this wreath and the rest of Dana's fun DIY Halloween decorations (like my favorite paper bats) over at MADE.